How has this recent storm and heavy rainfall impacted Corn? In North Carolina persistent and intense rainfall events often occur during planting in April and May resulting in flooding and saturated soils. Here are some issues corn growers should be aware of. 1. Situations Where Flood Water Covers the Entire Plant: As with most plants corn must be able to exchange gases – intake CO2 at the leaves and O2 at the roots. Therefore, corn cannot tolerate being underwater for a long time. Corn can be completely underwater for up to 72 hours before death of the plant occurs. Once this threshold has been passed the corn plant dies quickly. However, there is another key problem when corn is completely covered by water. Plants that have been covered by water for 24 to 48 hours can become infected with a disease known as Crazy Top. This disease is caused by a water-borne pathogen which infects the plant through the whorl when water covers the plant. This disease can cause the plant to grow in unusual ways often causing the tassel to have uncontrolled growth . Due to either death or the potential for disease flood water that covers the entire corn plant is a serious problem that can have serve yield impacts either now or later in the season. 2. Flooding were the corn plant is not underwater: Excessive water can result in poor nutrient uptake (yellow plants from lack of N or a multitude of symptoms such as purpling due to lack of P) and can lead to root diseases such as pythium or crown rot. In general, plants cannot tolerate more than 4 to 5 days of conditions where the soil is covered by water without showing symptoms of severe nutrient stress. 3. Heavy rainfall and saturated soil conditions but NO standing water or flooding: This is the more common issue across North Carolina from this rainfall event. The key problem in these cases is the leaching of mobile nutrients such as nitrogen, sulfur, magnesium or boron and/or denitrification of nitrogen. The question is how much of these essential nutrients have I lost and what should be done to replace them? It is difficult to determine the loss of nutrients such as nitrogen from leaching. In general, deep sandy soils will have the greatest loss due to leaching (up to 80% of the N applied) and clay or heavy organic soils will have the least (30% or less of the N applied). Corn is usually planted on heavier soils with less leaching potential. Even so leaching losses from 30 to 50% of applied nitrogen or sulfur can occur on Norfolk, Goldsboro, or even Lynchburg soils. Given the nature of this storm event the best guess in most cases is that around 30% of the applied N has been lost. Denitrification is also difficult to estimate. It depends on how long the soil remains saturated and soil temperature. Information from the University of Nebraska suggests that at soil temperatures above 75 degrees F about 20% of the N applied will undergo denitrification for each day the soil remains saturated. Denitrification will be worse on poorly drained clay or organic soils and least on sandy loams. What Can I do to Prevent or Reduce Yield Loss Due to Flooding? 1. Remove Excess Water as Quickly as Possible: Time is important. The longer the condition exists the more likely yield losses will occur. 2. 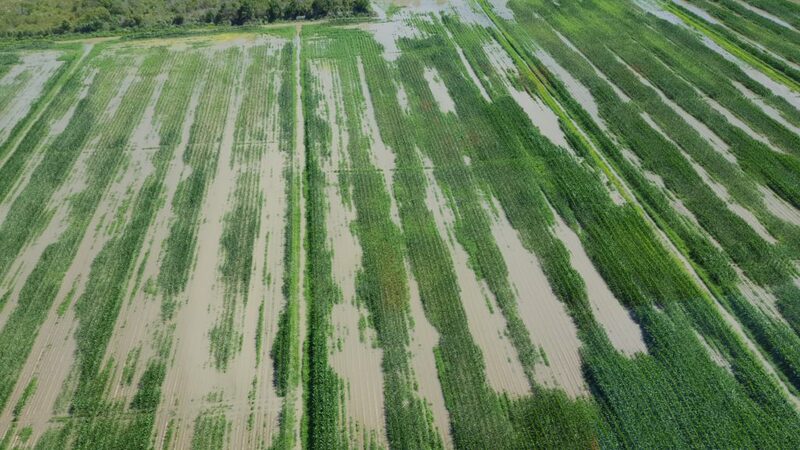 Corn that has been flooded: As soon as the soil starts to dry growers should assess the situation for the presence of drowned or diseased plants and determine how much stand loss has occurred. If more than 18,000 healthy plants remain per acre then the grower should plan on making sidedress applications of N and/or S as quickly as possible to help the plants recover. Depending on the situation growers may also need to consider adding K or nutrients such as Mg or B. If stand loss has resulted in less than 18,000 viable plants per acre then replanting another crop may be an alternative. 3. Corn that has not been flooded but where nutrient losses are the major concern: The first thing corn growers should do is plan on making a sidedress application of nutrients to their corn anytime from growth stages V4 (four leaves with collars showing) to V6. SIDEDRESS APPLICATIONS OF N AND POSSIBLY S, Mg, and B ARE GOING TO BE NECESSARY TO PREVENT YIELD LOSS EVEN IN SITUATIONS WHERE THE GROWER HAS ALREADY APPLIED ALL OF THE NUTRIENTS PRIOR TO PLANTING.